(ST. CHARLES, IL) – Local resident and business owner, Leah Hoppes, has written a marketing book for other small business owners. 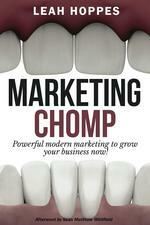 Marketing Chomp: Powerful Modern Marketing to Grow Your Business Now. Ms. Hoppes sits on the Board of Directors for the St. Charles Chamber of Commerce and was named the St. Charles Chamber Member of the Year for 2015. Prior to that, she served two years as the Marketing and Promotions Committee Chair for the Downtown St. Charles Partnership. Her company, Vision Force Marketing created the vibrant logo for the downtown rebranding of St. Charles which was unveiled just last year. She is a successful entrepreneur and owns Vision Force Marketing with her husband, Sean Matthew Whitfield. Published by Kingman Row Entertainment, Marketing Chomp became available in early October on Amazon and is available in paperback and on Kindle. Copies can also be ordered by visiting www.marketingchomp.com. The book is more than merely instructional. Those who complete the exercises in the readable and approachable narrative will be empowered to market their enterprise, service or cause and realize their business or personal goals. While the accomplished Ms. Hoppes cannot consult with every business owner or professional who might benefit from her expertise, Marketing Chomp is the next best thing. Ms. Hoppes, who was named as the St. Charles Chamber Member of the Year in 2015, has developed and implemented marketing strategies for companies in over 35 industries ranging from startups to multi-billion dollar global organizations. With over twenty years of marketing experience, and 15 years in manufacturing marketing, Leah brings a well-rounded and much-needed grounded approach to marketing. Ms. Hoppes now owns Vision Force Marketing with husband, Sean Matthew Whitfield, located in St Charles, IL. The company provides strategic marketing planning, coaching and leading edge solutions for business growth.